Included Zaporozhye Tour, Khortitsa Tour & Cossack Horse Show. Enjoy your morning cruising the Dnieper River on your way to Zaporozhye. Arrive after lunch and disembark for a tour of the ancestral home of the legendary Cossacks. Founded in 1770 at the peak of Cossack power, the city’s name means “beyond the rapids,” and is situated in the centre of the southwestern Ukraine steppes. Your tour also includes a photo stop at the Zaporozhye dam as well as a tour of the Khortitsa Cossack Museum. Continue your drive to Khortitsa Island for the Cossack Horse Show. 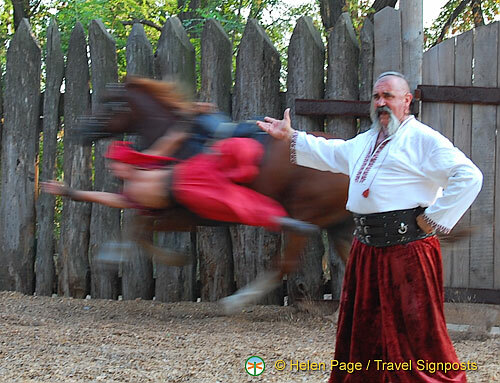 Upon arrival, you will be treated to a stirring exhibition of expert Cossack horsemanship. There will also be folkloric music and Cossack dancing. Return to your ship for dinner, which sails in the early evening. Enjoy dinner aboard. This morning we continue cruising on the Dnieper River towards Zaporozhye and we’re expecting to arrive there just after lunch. 10:30 Morning lecture on the history of Ukraine throughout the centuries. Also a presentation on the Zaporozhye Dam. 11:45 Information session on program in Zaporozhye. 14:00 We arrive in Zaporozhye and leave immediately for our city tour. Next we visit the Khortitsa Cossack Museum to learn a little about Cossack culture and their military history. After the city tour, we head for the island of Khortitsa where we walk in the Footsteps of the Cossacks and enjoy amazing Cossack horsemanship. You’ve got to have a high-speed camera to capture these riders flying past and doing their stunts. After the show there are market stalls on the grounds where you can buy handicrafts, t-shirts, costume jewelry, porcelain, etc. We’re back on the river boat by tea time and at 19:00 the boat sets sail for Kiev. After dinner there is a Ukrainian concert put on by the crew. Some of the staff are really quite talented and the show is entertaining.